Would having dinner with Miguel Gomes be a suitable substitute for seeing his celebrated film, Tabu? This was the question on my mind as I anticipated the evening of its screening at Edinburgh International Film Festival. I had been looking forward to seeing the film in the perfect darkness of Filmhouse One ever since the festival secured it earlier in the year. There was a certain quiet excitement among staff (and I’m sure audiences) about seeing the film that impressed so many in Berlin. Working for the fest, I’d had a chance to see it, but passed it up in favour of the public screening – its UK premiere. When the time came my plans for the evening changed – rather than see the film I would be accompanying guests to the EIFF Ceilidh, one of whom was Miguel – thereby helping out the very busy Artistic Director. It was a tough job, but someone had to do it. I liked Miguel instantly – he claimed to desire only whisky since he landed on Scottish soil. On the way to dinner I apologised that I hadn’t seen his film yet, and rather than be offended he was very self-effacing about its quality and told me not to worry, saying – you know there’s this other very famous film called Tabu, and mine isn’t as good as that (I’m paraphrasing of course). Miguel turned out to be brilliant company – having now seen Tabu and his earlier film, Our Beloved Month of August its clear that his wonderfully dry sense of humour directly translates to his filmmaking style. Tabu has been described as a cinephile’s film – something that I must admit piqued my interest initially. I always get enthused when I hear such claims being made – they throw up such wonderful associations of reflexivity, references to cinema history and command of film language. I’m not ashamed to belong to the cinephile gang – mainly because it’s the only gang I’ve ever been qualified for. Happily, perhaps, Tabu can also be thought of as a love story, a tribute to romantic melodramas of the 1950’s and ‘60s’s. A film of two halves, Tabu’s first, titled ‘A Lost Paradise’ concerns a woman named Pilar (Teresa Medruga, pictured above); melancholy and lonely, she is neighbour to Aurora (Laura Soveral) – an eccentric older woman who has squandered her money countless times gambling, while her maid, Santa (Isabel Cardoso) patiently bears the brunt of her paranoid, vicious outbursts. Aurora claims that Santa is holding her captive and Pilar’s concern for her grows as her anxiety reaches ever-increasing levels. When Aurora is finally hospitalised, Pilar is tasked with finding the mysterious Gian Luca Ventura (Henrique Espírito Santo), Aurora’s former lover. The second part of the film titled, ‘Paradise’ sees Ventura tell the tale of the pair’s affair in colonial Africa. This short synopsis in no way does justice to the myriad pleasures of Tabu. Opening with a prologue about a Portuguese adventurer in Africa, seeking to abandon his despair for a lost love in the lush landscape – this episode turns out to be the film Pilar is watching – introducing us to the setting of Aurora’s romance and inviting us into the mystical unreality of the film world. Pilar is a character that seems enveloped with sadness – she wants to care for someone, and be cared for but there’s awkwardness to her social interactions. When Aurora seeks her help, she is almost enlivened by it – discovering the drama that fascinates her and the tragedy of this enigmatic figure’s past. Gomes creates in Pilar, an analogy for the cinema audience – fixated and hungry for the twist in the tale that will deepen the film’s meaning. Finding Ventura plunges Pilar and by turns we, the audience back in time to the sweet despair of a doomed lover’s adventure. ‘Paradise’ is first narrated by Ventura, beginning with a wonderfully playful moment that at once changes the mood of the film, paying homage to silent cinema and establishing Tabu as a masterful sound film. Following Aurora’s funeral, Pilar, Santa and Ventura go to a café in a mall. The camera pans left to show the artificiality of the setting, fake palm trees and a Toucan that reaffirm the virtuality of the film world. 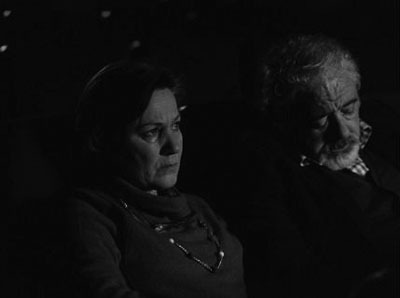 Just as Pilar takes a sip of water, Ventura speaks; “She had a farm in Africa”, to which Pilar replies; “Pardon?” at which point the diegetic sound cuts out, and the image cuts to younger Aurora and an extended flashback. ‘Paradise’ in fact contains no spoken dialogue, or sub or intertitles to describe what the characters say to each other, relying instead on voice-over narration by Ventura: Henrique Espírito Santo’s caramel toned voice so evocative of longing and weariness. By foregrounding the narration, Gomes highlights the potential for incongruity between sound and image, and the delightful subjectivity of the remembered past. Gomes uses music to wonderful effect throughout Tabu. There’s something so desperately sad about The Ronettes’s ‘Baby I Love You’ and ‘Be My Baby’ – in this case sung in Spanish – that demonstrates the nostalgia inherent in the film and the sometime purity of sentiment in pop music. 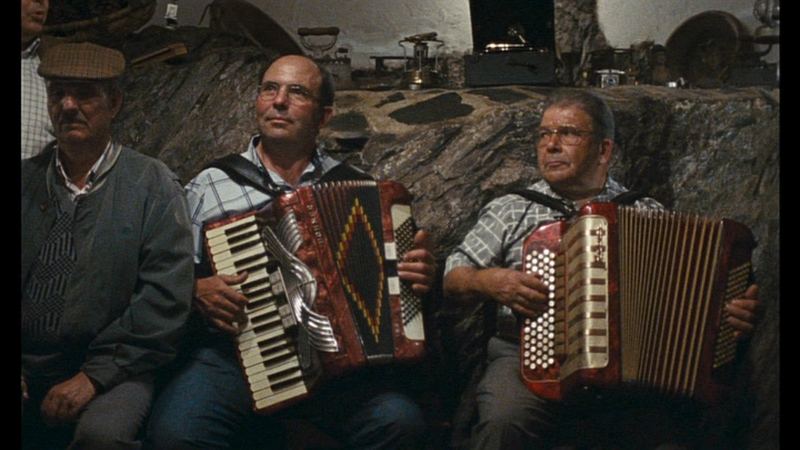 Music is also very important in Gomes previous feature, Our Beloved Month of August (2008, pictured above) set in rural Portugal. Like Tabu, Gomes’ highly celebrated earlier work is also a film structured in two parts, and one that brilliantly dissolves the line between documentary and fiction. Shot over two summers, the problems of the production are made clear in the film, with Gomes’ producer (pictured above, with Gomes on the left) visiting him to find out why the film he was expecting isn’t yet cast. That the same person turns up later in the film cast as one of the characters he describes is just one of many instances of Gomes witty dissection of the filmmaking process and arbitrariness of what is real/unreal. The musical aspect comes in the form of a focus on the amateur bands commonplace in the region of Arganil, where the film was shot. These bands mainly play love songs whose lyrics describe an array of woeful tales: stories that mimic those told by locals about themselves and their neighbours. One particularly lovely scene sees two men discussing their involvement in the film. Framed from behind them – as though eavesdropping, we learn that they are both locals to the area who were cast to play parts in the ‘fictional’ part of the film. One of them is baffled and perturbed by the spontaneous and seemingly disorganised nature of filmmaking: that he memorised his script and was at the last minute given new lines to learn. The other is more relaxed having acted before, but both are enthusiastic about being included and don’t want to appear as though they are really inconvenienced by the directors inherently strange methodology. Also included on the Second Run’s release is Gomes short film, Canticle of All Creatures, another marvellous combination of music, image and narrative that defies categorisation and contains an earlier example of the natural/awkward performing seen in Tabu. I’m very lucky to have met Miguel Gomes and I urge everyone to see his films, to give in to preconceptions of linearity, the boundaries of characterisation, and documentary/fiction and simply bathe in his gloriously ambiguous cinematic creations. Thank you Helena, I’m glad you enjoyed it. Gomes is truly an exciting filmmaker and still not appreciated enough. His films manage to be incredibly thoughtful and intelligent without pretension. I look forward so much to his next film! Thanks for the correction too – much appreciated! I really enjoyed reading your review about Miguel Gomes’s Tabu. It is in fact a sublime film, which keeps us from beginning to end in a sort of enchantment. I must confess that as I was surprised by the way Gomes manages to combine the legacy of Portuguese Cinema and of Cinema, in its broader sense, with such subtlety and originality. Just a (minor) correction, the version of “Be my Baby” in the film is in Spanish, and not in Portuguese.